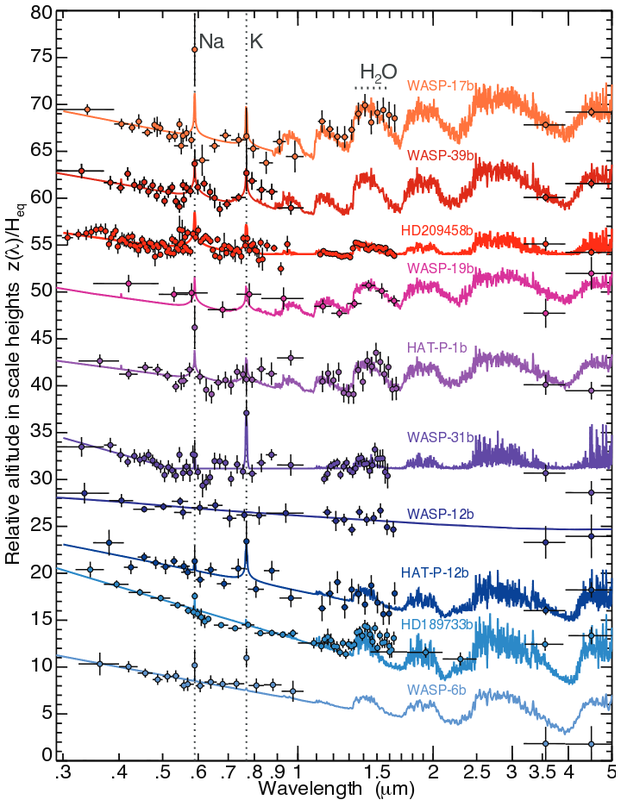 NASA, ESA and JPL have put out press releases on the atmospheric spectrum of WASP-39b. The paper by Hannah Wakeford et al combined Hubble and Spitzer data to produce a comprehensive spectrum with broad spectral coverage. Coverage of the press release includes that by Newsweek, the International Business Times, the Daily Mail and about 30 other websites. This entry was posted in exoplanet atmospheres, Hot Jupiters, Hubble Space Telescope, WASP planets and tagged Hot Saturn, Spitzer, WASP-39b on March 2, 2018 by waspplanets. WASP-39b is turning out to be one of the more important WASP discoveries, being observed with the Hubble Space Telescope, the Spitzer Space Telescope and large ground-based telescopes such as the VLT. This is because, as a Saturn-mass planet with a bloated radius, it has a low surface gravity and so is ideal for atmospheric characterisation. Further, it has relatively clear skies showing spectral features. The dominant spectral features are due to water vapour, while there are narrower lines due to sodium (Na) and potassium (K) and a Rayleigh-scattering slope at the blue end. The main finding from fitting the water features is that the atmospheric metallicity must be at least 100 times that of the sun. This high value shows the diversity of exoplanets. The authors conclude that “WASP-39b is an ideal target for follow-up studies with the James Webb Space Telescope”. This entry was posted in exoplanet atmospheres and tagged WASP-39b on November 30, 2017 by waspplanets. Transmission spectroscopy of exoplanet atmospheres — looking at the atmosphere of a planet in transit, backlit by the light of its star — is one of the major growth areas in studying WASP planets. 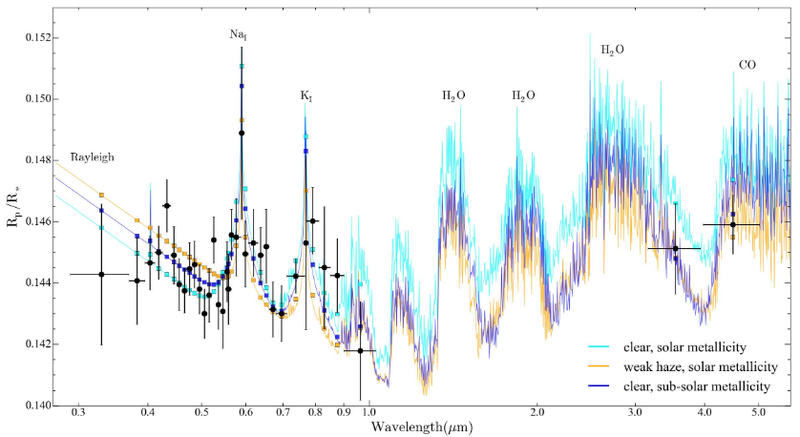 The latest such study is by Patrick Fischer and colleagues, who pointed the Hubble Space Telescope with its STIS spectrograph at WASP-39b in transit. The plot shows the resulting data compared with three models of WASP-39b’s atmosphere (depending on how clear or hazy it is, and on the metal abundance compared to the Sun). 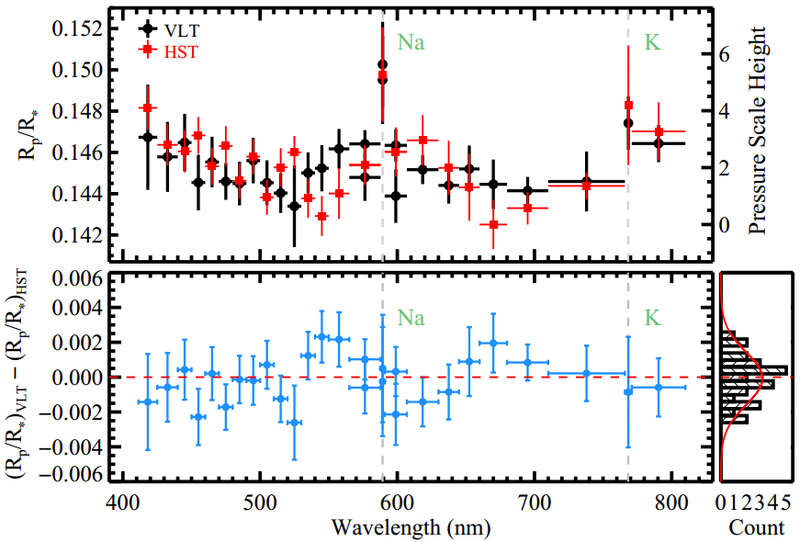 Unlike some hot Jupiters, which have very hazy atmospheres with few spectral features, WASP-39b shows a clear detection of potassium and sodium, as expected in largely clear skies. 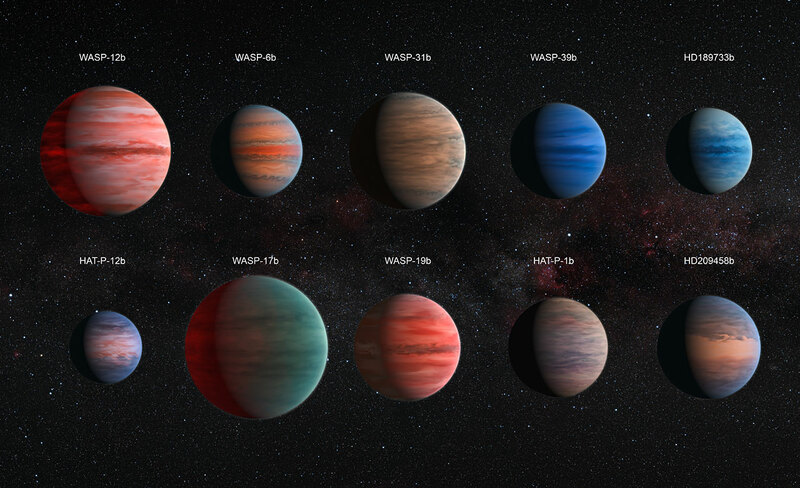 Comparing to the hazier planets HD 189733b and WASP-6b, Fischer et al remark: “These observations further emphasize the surprising diversity of cloudy and cloud-free gas giant planets in short-period orbits and the corresponding challenges associated with developing predictive cloud models for these atmospheres”. This entry was posted in exoplanet atmospheres, Hubble Space Telescope, WASP planets and tagged WASP-39b on January 26, 2016 by waspplanets.